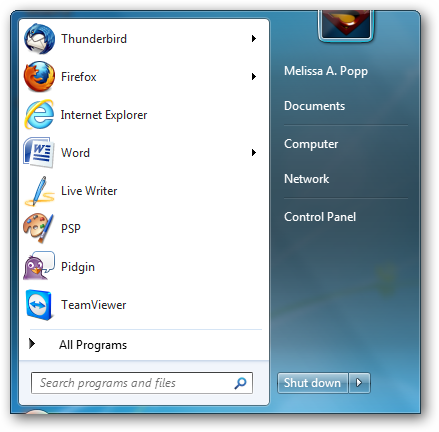 Windows 7 introduced the Defender to help protect your computer from the threats of being on the Internet. By introducing their own way to combat spyware, adware and more, Windows allows you to worry less about finding the right anti-virus, spyware, and software to combat these issues on your own. While the Defender should not be stand alone, it is one more tool in the arsenal against threats of being online in the world. The Windows 7 Defender’s primary purpose is to combat the harm that comes from spyware and malware. Windows 7 Defender is now part of the Windows 7 Action Center. I would recommend taking full advantage of what the Action Center and Defender offers to help keep your computer safe from harm. 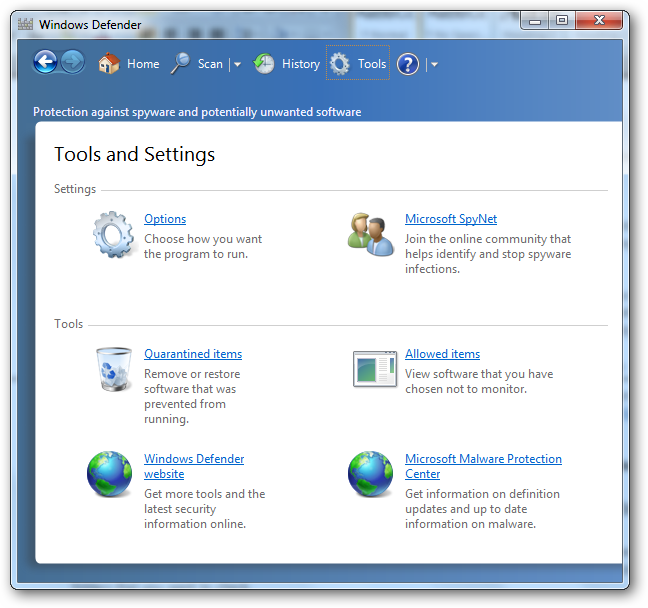 How does Windows 7 Defender work? 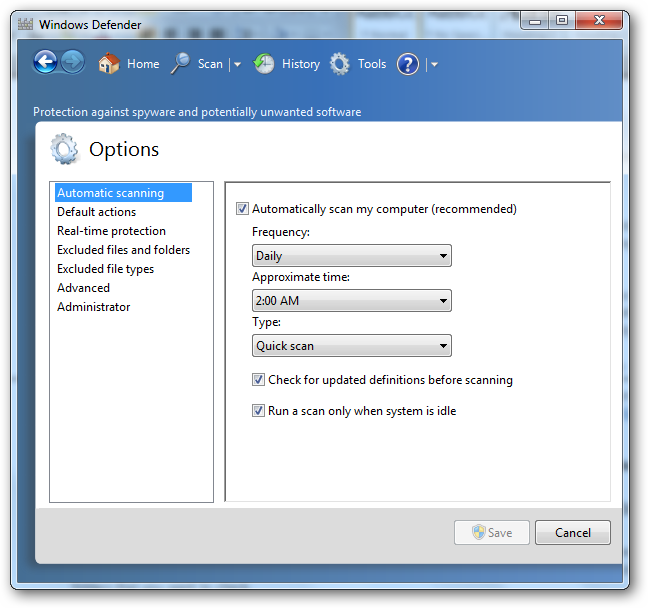 Windows 7 Defender works primarily in two different ways: Real-time and Scanning. Real-time protection means you are safe at all times because your system is constantly monitoring for threats. Scanning options in Windows 7 Defender gives you control over when you scan, or you can set up automatic scans to keep up on tracking down rogue malware and spyware. From there, type in “Defender” in the search box. This will bring back any result with the word “Defender” in it. Click on “Windows Defender” which will be under the Control Panel header. Windows Defender will open up and let you know if there are any current threats to your computer. If you are in the green, you are safe; if you are in the red or yellow, there’s some trouble. The main screen will tell you the date and time of your last scan, as well as what definition version you have. You always want to make sure your definitions are updated, because this keeps you safe from the latest threats. Let’s see how to work with Windows Defender. This is where you will find all the settings and options to work with in Defender. 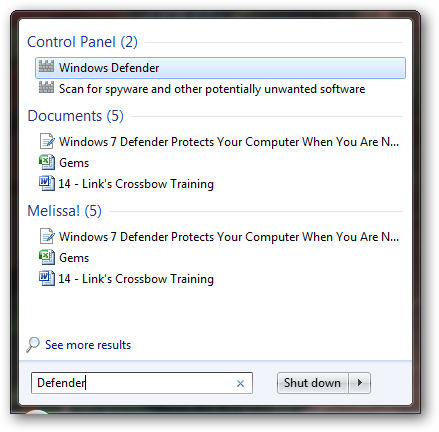 In the Options menu, you can go through each area to set up the way Windows 7 Defender works. For starters, you can choose if you want to set up automatic scans. Depending on how vigilant you are about keeping your computer clean, automatic scans may be the easiest way to use Defender. Default actions is where you can set up how Defender responds to threats. Real-time protection is how you can set up Defender to run in the background and constantly protect your computer. Excluded files and folders and excluded file types allow you to set up filters for Defender to ignore certain things on your computer. These can come in handy when Defender thinks something is a threat when you know it is not. Advanced and Administrator options allow you to further tinker with Windows Defender. Only advanced Windows users should venture into these areas. Remember to click “Save” when you are done tinkering with the options. Then, click “Tools” again. 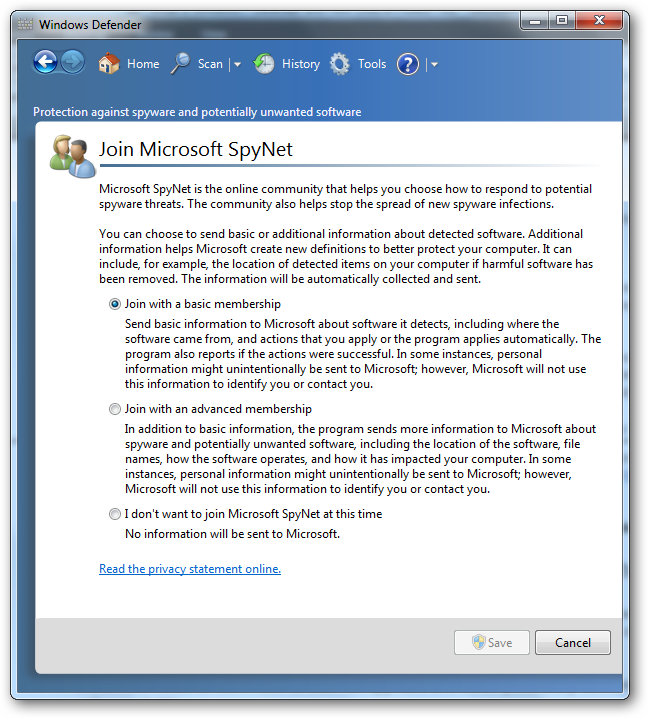 Microsoft SpyNet is similar to how their anti-virus programs keep a database of information on all sorts of threats. This includes old and new ones as well information on what they do and how to respond to the threat. Under the “Tools” header, you will see a few more selections such as checking out your quarantine and allowed items. You can also visit the Windows Defender website and Microsoft Malware Protection Center, too. Windows Defender is easy to use. Now, all you have to do is click on the drop-down arrow next to Scan. You have three options to choose from: Quick scan, Full scan, and Custom scan…. 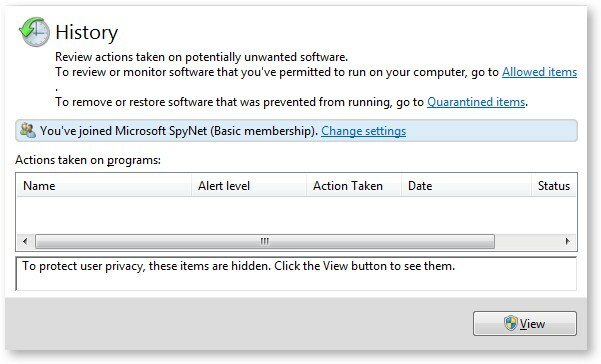 Quick scan searches just the most dangerous areas of infection on your computer. 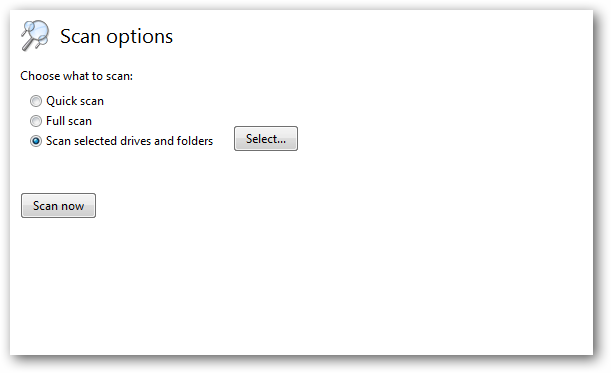 Full scan scans your entire hard drive and Custom scan… allows you to choose the parameters of your scan. If you click on Quick scan or Full scan, Windows Defender will immediately begin scanning your computer for problems. If you choose Custom scan… you will have to set your options before the scan starts. Click “Scan now” to begin. 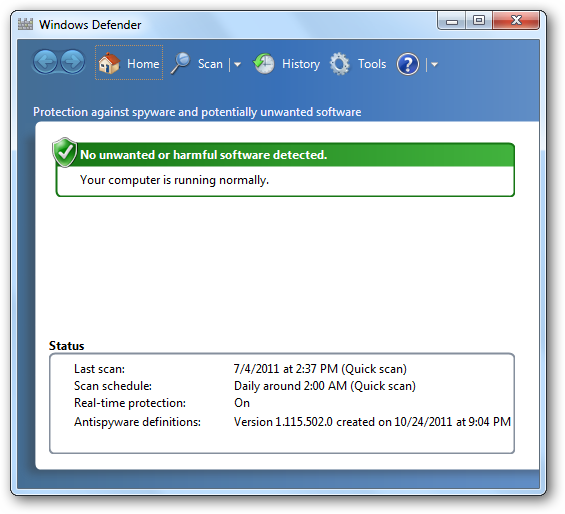 Once the scan starts, Windows Defender will show you the progress of it on the main screen. Depending on the scan, it could take a few minutes to over an hour. When finished, your will be given the Scan statistics. This will tell you how much was scanned, how long it took and if any items should be looked into. If you ever click on “History,” you will see the results of various scans and threats. You can check out Allowed items, Quarantined items and change the settings of Microsoft SpyNet if you desire. If at any time you have issues with Windows Defender, you can click the “?” icon. This will bring up the help options. You can check for updates here, view the help and learn more about Windows Defender. Does Windows 7 adequately protect your computer? Windows 7 Defender offers a basic level of protection against malware, spyware, and other threats. By utilizing the Action Center, Windows Defender and an anti-virus program, you can protect yourself from the threats that come from using the world-wide web. Finding the right anti-virus software, along with additional spyware and adware programs, can help keep your computer running no matter what you may come face-to-face with.